The need for a backyard that meets the charm required for an extremely inspiring home is a lot in various architecture projects today. Spicing up the patio is something many home owners want to do. While there are several backyard landscaping ideas that can shape your patio or backyard to become a serene breathtaking space, the best fire pits do this with considerable ease. There is something about having a fire to chat around when you are at home. This is the concept of the fireplace. Fires create a focus point. People sat around fire in the ancient times and told stories all night long. Again, this is concept around which camp fires became the norm in outdoor activity around the world. From giving your backyard that tweak that it needs to move from good to great, to warming up the cold evenings and winter days, fire pits are more than an immense addition to any home around the world. Technology continues to improve our lives. And not just ours, but for animals and pets too. Centuries ago people would transport building materials using their own hands carrying one block after another to the build site. Then the invention of the wheel and consequent invention of vehicles made work easier. People used to travel for long leaving their pets at home hungry and starved, now an automatic cat feeder for wet food ensures that not only is your cat fed but you also get to feed it both dry and wet meals without doing any work. The fire place has evolved too. From people collecting wood and creating a fire every time they needed one, to fire pits that now use propane and you don’t really have to go through the whole process of collecting fire wood. And yes, the fire is mostly smokeless. No soot; no unburnt wood to worry about later. We have tried various fire pits up-to this point and come up with a list of the best fire pits for any home owner seeking to improve their patio or backyard. This beautiful little fire pit is one of the best fire pits of its size. It is compact and lightweight, pleasing to the eye and very portable. If you are going out for camping it will fit very nicely in the car, if you are keeping it in the house somewhere it can tuck itself in a shelf or a designated corner and still remain barely noticeable. You can use it on the balcony, backyard, or patio and it will take up very little space. It measures only 48 cm (19 inches) and weighs about 11 kilograms(25 pounds) but makes a ton of heat; more than 55,000 BTUs. For safety and to keep the propane gas tank far from the fire pit, the fireplace has a long hose to allow setting the tank away from the burner. To start the fire, you need to push the ignition button while to control it, you use the dial. It has decorative rocks which serve well to improve the beauty of the whole composition whether it is on the patio, yard, or campsite. As its hallmark into the best fire pits, it comes with a strap system which you can use to carry it around from and into the car, house, backyard, or wherever you plan to use it at. Due to the high quality steel construction with a protective enamel finish, this fire pit will serve you on the outdoors barely feeling the effects of the weather. Additionally, thanks to its small size, if you are worried about weather effects on the fire pit you could just carry it into the house when you are done using it. Owing to the size, looks, and amount of fire it produces, this is one of the best priced propane gas fire pits. With over 440 reviews and a rating of up-to 4.8 stars on Amazon, you can never go wrong with the Outland Firebowl as a choice. Some users have termed it the best for all-round activities from camping to just hanging out by your patio. Other users think it has high quality craftsmanship for its price and too sturdy it amazes. Probably the easiest fire pit to assemble. Makes a large fire with no smoke. Compact and lightweight for carrying around. Can be used for a variety of purposes due to portability. Uses a lot of propane due to its large fire. This is one of the best fire pits to win international awards. Its design complements any backyard or patio without much hustle. It can be used for any outdoor space for warmth in cold days, mornings or evenings. The fire pit can be used for lengthy duration without requiring maintenance at all. Its plaited or woven Polyethylene around the body is very weather resistant to ensure that the durability and strength of this fire pit table is guaranteed. The frame is made from powder-coated aluminium making the whole pit table a strong and sturdy addition to your patio. The table has a height of 23 inches (58 cm) with a width of 32 inches (81 cm) and a length of 44 inches (112 cm). This is a good size to make a good statement on your backyard if you would love the feel of a proper table. The tempered black glass top provides space around the fire to place your drink or even your feet without fear of burning, of course if the fire is not spreading out too much due to wind or its intensity. The package comes with a decorative glass rock set to give you the proper landscape feel while the fire burns. 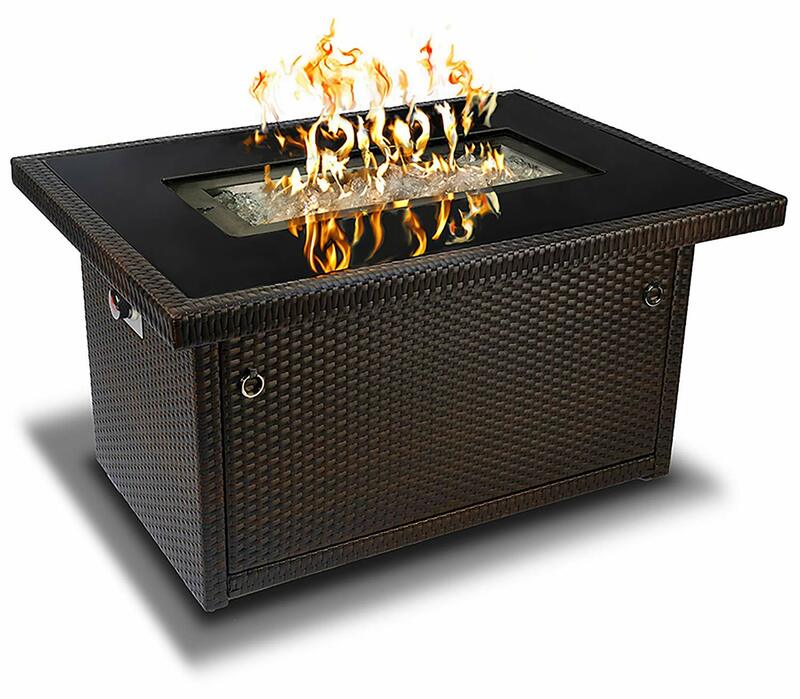 To light the fire pit table, an ignition button is provided on the side of the table which also allows for proper control of the 35,000 BTUs of heat it will ignite. To light it, you will need a propane tank which is not provided with the table and you have to purchase that separately. It has internal storage for a standard 20 lb (9kg) tank. A chrome manual control allows you to control the flame height depending on what you would like to achieve. The flame is smoke free. It comes with a warranty of one year. Despite its somewhat steep price of $549, this fire pit table has received over 411 reviews on Amazon with an overall rating of 4.8 out of 5. It ranks first in fire pit tables. Some customers have praised it for its easy assembly, and others have called it the centre of the party. This is definitely one of the best fire pits if you are willing to spend a little more but there is a lot of value for money in the purchase as well. Sturdy and strong fire pit table. Designed to fit in with a variety of outdoor furniture and finishes. Extremely good customer support from the company. Comes with beautiful glass rock. Doesn’t come with a cover and you might need to buy that separately if you need one. This fire pit first debuted on Kickstarter raising a whooping $1.1 million. It was loved, and it beat its target by thousands of percentage points. The stainless steel constructed fire pit is now one of the best fire pits on Amazon, selling like ghost cookies. It is the only wood burning fire pit in this guide, for a good reason. The fire pit is designed with a double wall that enables unique airflow efficiency to make it extremely magical. The stove has air intake holes at the bottom to channel oxygen into the fire as it burns. This holes also pass warm air up the walls of the stove enabling further heating back into the firebox through smaller holes at the top of the stove. The first mechanism is what the company calls primary combustion, and as air passes through the top holes back into the burner it enables the secondary combustion. The result is a more complete burn ensuring no smoke comes out of the fire and that all the wood is used up to relieve you the stress of collecting half burnt logs of wood when you are done using the fire pit. For the patio, this fire pit is a revelation. Its smokeless fire ensures you will not spend your time dodging smoke and neither will your clothes be smoking like you just spent a day inside an average wood burning stove. The fire pit is not too small, definitely not the backpacking kind. It measures 35cm (14 inches) tall and has a diameter of 50cm (19.5 inches) weighing in at 9kgs (20 pounds). It is compact and lightweight nonetheless. It does not need to be assemble, it is ready to use as soon as it is delivered. Despite its fire burning efficiency, this solo stove fire pit requires cleaning more often because the soot lines up the walls and sometimes the ash is stuck in the holes. However, to make it easy to clean, flip it upside down to get the ash out. It also smokes for a couple of seconds when you initially light the logs which is quite understandable. Once the fire gets going there will be no smoke, literally. This is not the kind of fire pit you leave outside in your patio or back yard for a few days. It does not resist weather elements very well and requires to be kept away from rain to prevent it from rusting. The polished stainless steel exterior is minimalist enough to bring out exquisite outdoor design, however, if you do not keep it away from rain or morning dew it that like might wear off sooner than you expect. It can be used for camping as it fits well into most cars. This fire pit has over 360 reviews on Amazon with a general rating of 4.8 stars out of 5. Some people have said it is the best fire machine they have ever seen at such a small size. Others have written that their patio experiences are now more defined thanks to the fire pit. It is a bit pricey for a log burning fire pit? Yes it is. Is it worth the price? We definitely think it is and if you are loloking for something aroundthis fit, getting this will dazzle you. Minimalist outdoor design to match any type of patio furniture. Burns every inch of wood to ash. Airflow efficiency mechanism is a great concept. Does not resist weather elements and might rust fast if exposed to rain often. Requires cleaning after every use. This fire pit features a steel rim top plus real inlaid brick to fit a classical style that matches well with most outdoor furniture. It takes shorter than an hour to assemble and light up when you press on the button. The fire pit is weather resistant and long lasting. It needs a propane tank (bought separately) to light upto 30,000 BTUs of heat. The tank is well hidden under the case to ensure that the good looks are maintained. The package includes lava rock that adds a good aesthetic look to the flame. After heating up, these rocks contribute a lot of heat to the outdoor space aside from just the heat coming from the flame. To protect it from weather elements and wind abrasion, you could use the protective cover made from vinyl that comes with the fire pit. However, like most of the best fire pits you don’t need to cover them. The covers are just for users who prefer to take extra care for the pit if you are not using it. The Endless summer fire pit has received over 300 reviews giving it an average of 3.9 out 5 on Amazon. A lot of the customers love it and have called it the only fire pit you will need. Others have complemented its small size making it very portable and fitting in a small patio. Whether you need one for your patio or the backyard, this fire pit is sturdy and will definitely serve you well. Won’t get too hot or uncomfortable like wood fire. Made from weather resistant steel. Electronic ignition makes it very easy to light. Might start to show wear and tear after 2 to 3 years of continuous outdoor usage. Protective cover is plastic and will easily tear. With over 200 customer reviews on Amazon, this fire pit is one of the best bargains for adding some aesthetic feel to your patio or backyard landscape without breaking the bank too much. It has a nice feel and it looks like a permanent fixture to your space. The rugged look is safe enough for it to be left out in the cold, rainy, icy, or rough landscape. It is as outdoor as a fire pit can be. Onto the most important thing; the fire. This propane gas fire pit produces upto 30,000 BTUs of heat making sure that it is enough to warm your patio and your friends on a cold day or night. Without having to mess with wood and ashes, you can enjoy the warmth and its easy setup. You need a standard propane gas tank that is hooked up and hidden in the fire pit’s casing below. To get the fire you press a button and sit back as it warms your space. The pit has enough space around it to place a snack, beverage, or your feet if you are sitting back on a nice outdoor seat. Just don’t put either of these things too close to the fire, especially your feet. The pit comes with a cover if you would like to cover it for the times you are not using it. However, if you forget to do that, no problem. The pit will still function at its best level. Lava rocks to add some beauty onto the pit are included in the package. They help disperse the dancing flames around the recessed area that holds the burner. No matter the weather and how long you leave it out for, it will keep lighting on. It has a rating of 4.1 on Amazon and some users have described it as a sturdy fire pit that is portable and easy to set up. The aesthetic appeal has been most appreciated. The propane gas fire pit is very well priced as well ensuring that customers don’t break the bank to afford it. This makes it one of the best fire pits in the market. Produces a lot of heat. Some customers have complained about the fire pit not being able to stay lit or responding every time you push the button. Some customers complained about wear and tear on the sides of the fire pit after a year making it look really ugly.